Sunnyside Barn is a detached 3 bedroom 2 ensuites newly converted Barn situated in the grounds of The Old Stables. It has a wealth of beams providing a lot of charm and character. The Barn has been finished to a high standard and so has all the modern day comforts. There is underfloor heating to the downstairs and radiators upstairs, it is a very warm barn. The open plan sitting and dining areas are great for holidays and all being together. There is parking for 2 cars , a garden and patio area with table and chairs. Uninterrupted views of the countryside from the back garden. Whether you enjoy peaceful country walks, having fun on the beach, visiting local towns or just sitting reading a book and admiring the view Sunnyside barn is the perfect location for your holiday. Berghapton is a charming village renowned for its Sculpture trail. We look forward to welcoming you. I am Caroline, married to Kevin, we have a son living and working in London and a daughter currently doing her A levels. I am a Nurse working part time and Kevin is a builder. In 1997 we bought The Old Stables and converted them into living accommodation for our home. Kevin did all the work and we have since added extensions to our property. In 2010 Kevin commenced work on Sunnyside Barn within our grounds to convert the barn into a holiday let . Sunnyside Barn was completed in 2014 , it has been converted to a high standard . The village of Berghapton is delightful, with many lovely walks and beautiful countryside. Peaceful location. Everything you would want for a lovely holiday / break with modern amenities but with the character of a great Barn conversion. Uninterrupted views of the countryside from Sunnyside Barn. Central location for Norwich , lovely beaches and the Norfolk broads. toilet, tub, shower, Complimentary toilet roll, additional supplied by guest . toilet, shower, Complimentary toilet roll , additional supplied by guest. toilet, shower, Complimentary toilet roll, additional supplied by guest. The downstairs bathroom has a toilet, washbasin, bath with shower over, heated towel rail and shaver point. Ensuite to bedroom 1 has a shower, toilet ,heated towel rail and shaver point. Ensuite to bedroom 2 has a shower, toilet and shaver point. AS ABOVE : initial toilet roll is supplied for your arrival but guests are requested to supply any additional toilet rolls required for the duration of their stay , thank you. Radiators upstairs and underfloor heating to the downstairs of the property. The barn is very well insulated so is lovely and warm. There is a combined washer/ dryer in the utility room of the Barn. ample parking for 2-3 cars. There is internet access at the barn but due to our beautiful rural location and an abundance of trees surrounding us - the internet can be quite slow. A bath Towel and a hand towel in white for each guest. There is a hand towel provided in the kitchen and downstairs bathroom for the guests use. A tea towel is provided too. Please bring your own dishwasher tablets . Ceramic hob , please use the hob cleaner provided and no abrasive cloths. There are 2 ovens in the barn. This is stored in the Utility room. 2 cafetieres in the Barn for your use. An abundance of utensils and crockery is supplied. The kitchen has cream fitted units with 2 electric ovens with an electric hob, extractor fan, large fridge/freezer, toaster, kettle, integrated dishwasher and many kitchen utensils and cook ware. A small pine table. Tiled floor with underfloor heating. There are 6 chairs around the dining table , but there are 2 additional chairs in the kitchen which can be added to the dining table to seat 8 people. Please note : the garden is not fenced in . There is a patio with a round table and seating for 6 people . Some excellent golf courses nearby situated in Norwich, Barnham Broom and Bungay. Notes on accommodation: Sorry no pets . Non smoking. Outside: Shingle drive with parking for 3 cars. Garden and patio area to the rear of the property , this is not fenced in. Table and chairs, BBQ in the summer. Utility Room: The utility room has a couple of cream fitted units and worktop. In here is the washing machine combined dryer, iron, ironing board, microwave, clothes airer and clothes pegs. Cleaning / Towels / Linen / Maid service: All Bed linen and towels are included. The property is cleaned between each rental, however if staying for a longer period the property will be cleaned each week. Towels and linen will be changed between rentals. Other: There are 2 staircases within the Barn, one staircase leads to the twin room . The other staircase leads to the king and double room. This is a really pleasant property. Lovely welcome with bread and milk in the fridge. Home made cake on the table on arrival. Well laid out property with great attention to the customers requirements for a holiday stay. If you are looking to stay anywhere here you can’t go wrong staying here. We went to a local pub for meals and it was fantastic food. Went to Horsey to see the great deals on the beach. Loads of information in the cottage for excursions. Our only comment would be that my partners Mum found the seating in the lounge a little too low to get out of. Fine for most, and did not spoil the stay nor would it stop us from staying again. Thoroughly enjoyed the stay. Thank you. Glad you enjoyed your stay at Sunnyside Barn. We are lucky enough to have some good pubs and restaurants nearby providing good food . Horsey Gap to see the Seals on the beach is such a lovely thing to do when visiting this area. I am sorry your partners Mum found the grey sofa in the lounge area rather low - the cream sofa by the screen doors is higher and firmer so if you visited again we could swap them around . We do have 2 sofas and an armchair in the Barn to suit differing tastes. My friends and l had a brilliant weekend away at Sunnyside Barn. The property is really spacious and very comfortable. It’s very well equipped and the property was lovely and clean. The barn is located in a very rural setting which was great for our get away. Caroline, the owner was on hand to recommend local pubs and taxi firms. We definitely plan to make a return visit. Thank you very much for your kind review . We are very pleased you all enjoyed your stay at Sunnyside Barn . We are very happy to make recommendations if requested. We shall look forward to welcoming you back in the future . My partner and I had a week in Sunnyside Barn with my parents in August and yes, it really is as stunning as the images convey! Plenty of room, every comfort and necessity catered for and so many little touches that make it feel like home. Sunnyside is in a great location. Very peaceful and quiet and due to very little light pollution so the stars at night were incredible. Caroline and Kevin are excellent hosts and we would definitely return for another relaxing and restorative stay! 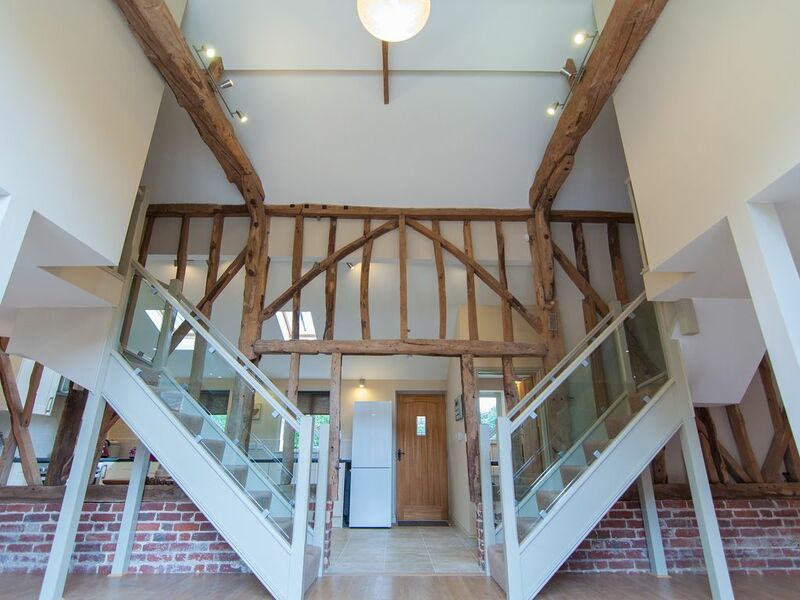 Such a lovely place, high spec barn conversion. Fully equipped. Beautiful setting, a great place to explore the Broads. Caroline even baked us a cake (and it was delicious)! Wonderful barn, comfortable and very relaxing and just what we needed for family time together. Thank you Michaela for your kind review . We are glad you enjoyed your stay , you were lovely guests to have . We needed a good base over several days for a family wedding in the area and we were delighted by what we found at Sunnyside Barn. Caroline is an excellent host and provided us with all we needed and more in this attractive barn renovation. It's very well fitted out, very clean and comfortable. She's shown great attention to detail, all the making for a perfect stay. It is in a glorious peaceful setting, surrounded by fields and woods. I so enjoyed watching the deer a few yards away dancing down towards the river while I had breakfast at the big table outside. We couldn't have wished for more, apart than perhaps staying on for a few extra days. Thank you Liz and Julian for such a lovely review of your stay , you were lovely guests to have here and we would love to welcome you back in the future if you were ever this way again . We love living where we are so it is nice for Sunnyside Barn guests to enjoy our peaceful surroundings . We have Fallow and Muntjac deer regularly visiting the garden so it was lovely you had this sighting . Beautiful sandy beaches along the North Norfolk coast line, Brancaster, Holkham and Burnham all take an hour driving but well worth a visit. Popular Southwold and Walberswick are just under an hours drive away. The Norfolk broads are close by offering boating activities. Norwich airport is 30 minutes drive away and offers international flights via Schipol airport. Stansted airport is 90 minutes drive away. A car is recommended due to village location , buses are available but a limited service. The City of Norwich is only 8 miles away, Norwich has a Cathedral, a Castle, many Museums, Cinemas, Theatres , lovely restaurants and cafes. The market Towns of Beccles and Bungay are nearby with shops, boats to hire , a weekly market and places to eat. Loddon with a few local shops is a 10 minute drive away, with pubs and fish and chips. Local farm shops selling local produce and farm reared meat. Local pubs nearby serving excellent food. Two farm shops within a few miles selling local produce. Excellent farm shop nearby selling local meats. Larger Supermarkets In Norwich and Beccles. Smaller supermarkets in Poringland and Loddon , a few miles away. Booking Notes: A security deposit of £200 will be required ,this will be refunded within 1 week of your departure. Changeover Day: The barn is booked from Friday to Friday. Short breaks are Friday - Monday or Monday - Friday. On the day of your arrival the barn is available from 4pm. On the day of your departure the barn is vacated by 10am. Notes on prices: Prices for weekend stays and midweek breaks are available on request.